Take a deep dive into evidence-based learning with our webcast series package. Almost 20 hours of training provide 18 CU credits upon completion. 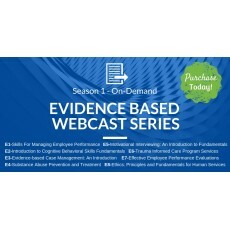 Save $105 when you purchase Season 1, an evidence-based webcast training bundle. Episode 1: Skills For Managing Employee Performance. Click here to learn more. Episode 2: Introduction to Cognitive Behavioral Skills Fundamentals. Click here to learn more. Episode 3: Evidence-based Case Management: An Introduction. Click here to learn more. Episode 4: Substance Abuse Prevention and Treatment. Click here to learn more. Episode 5: Motivational Interviewing: An Introduction to Fundamentals. Click here to learn more. Episode 6: Trauma-Informed Care Program Services. Click here to learn more. Episode 7: Effective Employee Performance Evaluations. Click here to learn more. Episode 8: Ethics: Principles and Fundamentals for Human Services. Click here to learn more.